In a world where you typically need to choose between outstanding sound quality or portability, the Studio 19 Solo EQ offers both. There’s an abundance of speakers out there in 2018 to fit practically any need you have — top-end options from Sonos, smart assistant speakers from Amazon and Google, and a ton of Bluetooth speakers at practically every conceivable price point. It can be hard to stand out from the pack — but Studio 19’s Solo speakers do not have that problem. From the design and sound quality to its portability, the Solo E500X-EQ is a cut above in the premium speaker market. It’s a top-end speaker for all your home entertainment needs that you can also take with you anywhere because it’s also a portable Bluetooth speaker — the best of both worlds. Bottom line: The Solo is simply one of the most compelling Bluetooth speaker I’ve ever tested, and is by far the coolest piece of tech I’ve tested in 2018. 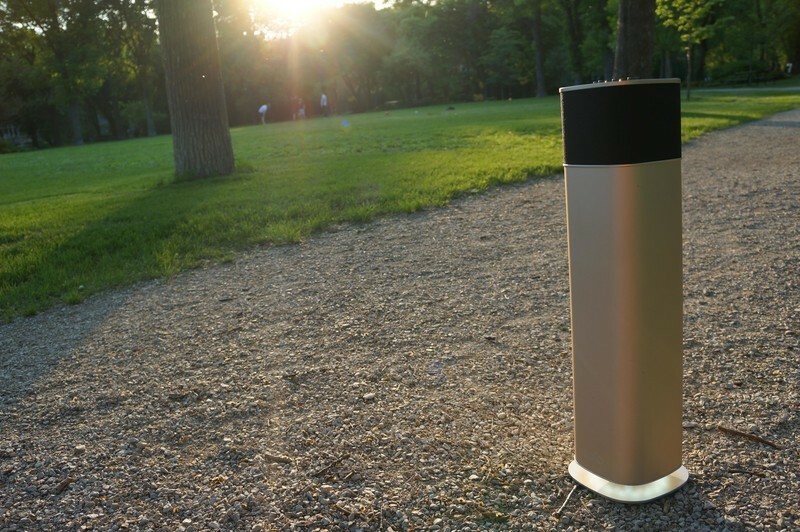 It’s straight up one of the best sounding portable speakers no matter where you take it. 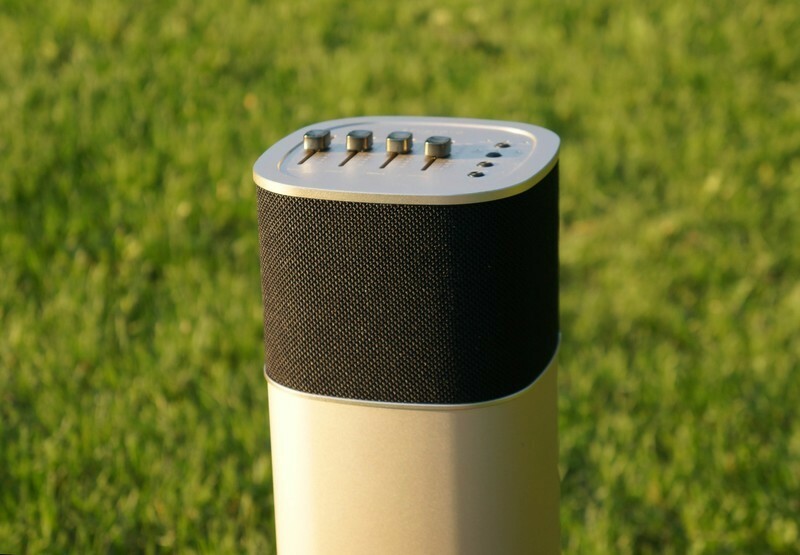 Designed by Studio 19 from London, UK this speaker makes some really bold claims about its design and sound quality. Unlike other bookshelf speakers, the Solo EQ is designed to be placed on the floor. Standing at just under two feet tall, it’s the biggest standalone speaker I’ve ever used, but every inch of space seems designed to maximize playback quality. Looking at the schematic on the side of the box, the majority of the speaker is a cavernous space used to boost bass — to great effect. When I cranked it to the max with some bass-heavy music I could feel the whole room shake with every thumping beat. The speaker array in the top section feature four speaker drivers arranged to deliver 360-degree sound that sounds as good as any sound system I’ve heard. The distinct highs and lows from techno and hip-hop music, in particular, sounded fantastic on the Solo EQ, but anything you play through this speaker will sound amazing. There are distinct modes available for watching movies or playing videos which come pre-programmed to highlight different sound details. Movie mode will keep the ambient, dialogue, and soundtrack levels balanced while testing the gaming mode playing Half-Life 2 was somehow as immersive as playing the game wearing headphones. There are three ways to connect the speaker to your favorite media — 3.5mm AUX input, HDMI, or Bluetooth. Connecting via Bluetooth is fast and secure, and thanks to the speaker’s size, the connection range is really strong. The most surprising part of the Solo EQ beyond how great it sounds is that it’s essentially a wireless Bluetooth speaker. It’s sort of shocking to use a portable speaker that sounds this good. Designed with an 8800mAh battery, you should be able to get up to 8 hours of playback before it needs to be charged via USB-C.
It’s sort of shocking to use portable speaker that sounds this good. If you’re planning to use the speaker in a remote location where you won’t be able to easily recharge the speaker from a wall outlet, I’ve tested powering the speaker using a portable battery pack and it worked just fine. If you’re planning to keep this speaker in your home, you can leave it plugged in with a standard smartphone charger and USB-C cable — although it seems like a bit of an oversight to not include a hardwired option or the necessary charging equipment in the box (only a USB-C cable arrived with my review sample). I like putting any speaker I review through the paces in different real-life scenarios, and the Solo EQ performed beyond my expectations in every situation. The Solo EQ managed to consistently fill the space with crystal clear audio. Studio 19 claims its patented DPAC system will produce space-filling, high-fidelity sound with full bass that will match or surpass any conventional subwoofer you’ve heard before — and damn if it didn’t live up to those lofty expectations. Whether you plan to primarily use it in a smaller bedroom or office, as an all-in-one unit for your home entertainment setup in the living room, or take it with you outside or in bigger, cavernous spaces such as a community centre gym, the Solo EQ managed to consistently fill the space with crystal clear audio. I’ve been bringing it along with me to my weekly dodgeball games to test how the speaker would contend in a bigger, noisier space. Not only did the speaker turn heads, it also performed amazingly at filling the entire gym with music that carried over the busy sounds of the game. As much as I’ve loved using the Solo EQ, there are some shortcomings that need to be addressed. For starters, there’s a somewhat weird bug where if you have your phone paired to the speaker via Bluetooth with nothing playing, occasionally the speaker will let out some troubling clicking sounds. It only seems to happen when the speaker is connected and left idle, but it certainly doesn’t sound healthy when it happens. It sounds like the speaker is dying, but I haven’t noticed any lasting effects from it. Because of the analog graphical equalizer on top, there’s no waterproofing here at all. 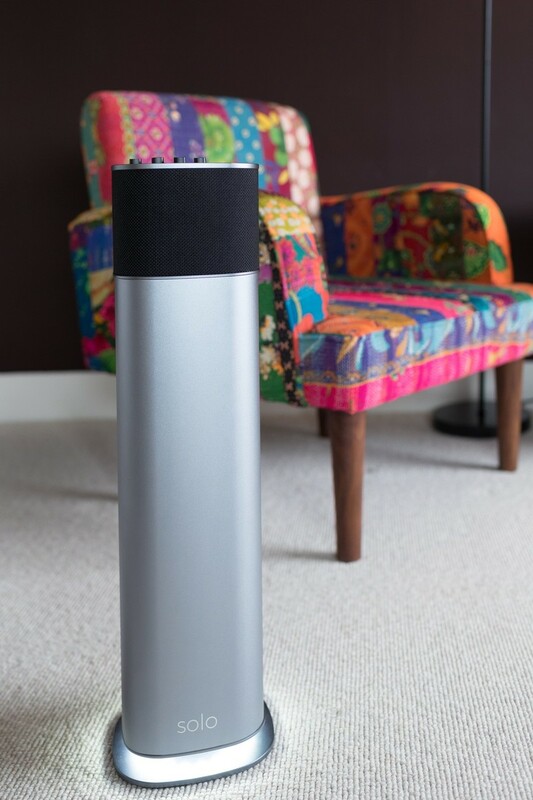 This is fine if you’re content with keeping it indoors, but with a portable speaker of this quality you’re going to want to take with you to the cabin, or outside for a patio party, and so it would have been a nice feature to include somehow. Another minor want: it would have been nice if the bottom light was customizable RGB, or could be synced to bounce along to the beat of the music. The only other issue is that because this is a UK-based company, international shipping might be a bit of a pain. 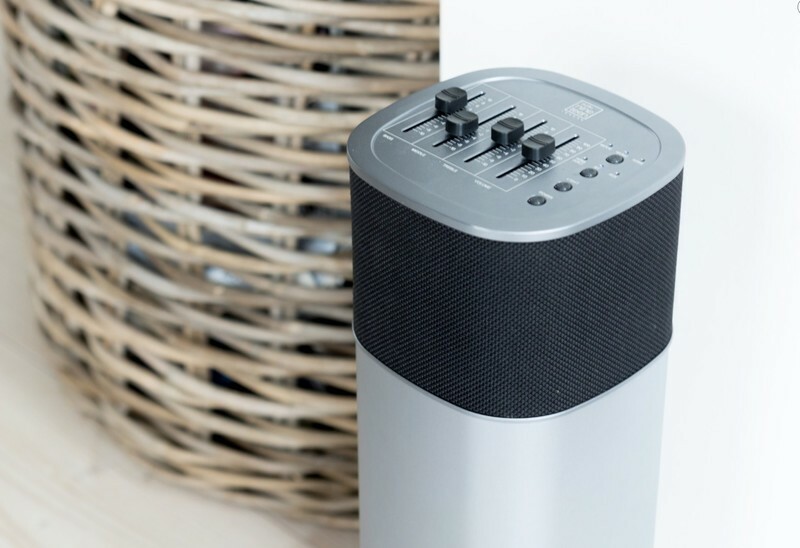 Studio 19 sells the speaker for £399 via Amazon UK, but for customers elsewhere in the world you’ll need to buy directly from the Studio 19 website. It’s also a premium product, starting at $534 USD before shipping costs which puts it in the same range as the Sonos Play:5 or Google Home Max except you lose out on the connected features of those speakers for the ultimate portability offered by the Solo EQ. The Solo is simply one of the most compelling Bluetooth speaker I’ve ever tested, and is by far the coolest piece of tech I’ve tested in 2018. It’s straight up one of the best sounding portable speakers no matter where you take it. It’s a shame that Studio 19’s international distribution network is so limited, because I could see this speaker really catching on if people could hear it for themselves or buy it from a reliable source such as Amazon. Everyone I’ve shown this speaker to have been impressed by the sound quality and design. If this is your first time hearing about Studio 19 and their products, I’d say they’re a company worth keeping an eye on as they continue to refine their uniquely designed speakers.